Today in Masonic History Harold Alexander, 1st Earl Alexander of Tunis passes away in 1969. Harold Alexander, 1st Earl Alexander of Tunis was a British Army Officer. Harold Alexander, 1st Earl Alexander of Tunis was born on December 10th, 1891 in London, England. He was educated at Hawtreys Preparatory School and Harrow School. He at one point considered becoming an artist, instead attending the Royal Military College, Sandhurst. In 1911, Alexander was commissioned a second lieutenant in the British Army. Prior to the beginning of World War I he was promoted to lieutenant. At the age of 22, Alexander was placed in command of a platoon at the Western Front. He would spend most of time on the Western Front during the war. Notably he would only come away from the Western Front when he was wounded, returning shortly after to resume his command. By the end of the war, Alexander had been promoted to an acting lieutenant colonel. Between World War I and World War II, Alexander would serve in a variety of duty stations around the world. He would also be promoted to the rank of major-general. He would serve largely during this time in India. He would also be appointed as one of the aides-De-camp to the newly coronated King George VI. He would leave his command in India to participate in the King's coronation. 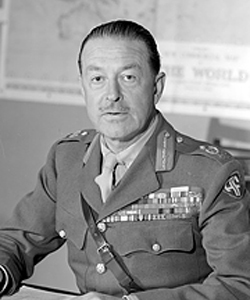 In 1939, after the outbreak of World War II, Alexander would take command of a division serving in France. He would lead the division's withdrawal to Dunkirk and would remain on the beach until he was certain that all British soldiers had left. Back in England he would be placed in charge of various defense forces around England. At one point he was made the General Officer Commanding-in-Chief (GOCIC) of the Southern Command, which was responsible for the defense of southwest England. In 1942, when the Germans invaded Burma, Alexander was sent to be the GOCIC of the British forces in Burma. Again, Alexander distinguished himself and was recalled to England just a few months later. Winston Churchill placed him in the position of Commander in Chief of the Middle East Command, placing him in charge of Operation Torch which was an Allied offensive against Axis forces in North Africa. In 1943, the Axis forces in Tunisia surrendered. Alexander's forces which had been re-designated as the 15th Army group consisted of two armies, one commanded by British general Montgomery and the United States General George Patton. For the rest of the war, Alexander would oversee the Allied efforts in Italy and would accept the surrender of the German forces in Italy. By the end of the war he would promoted to the rank of Field Marshal. After World War II, King George VI, at the request of the Prime Minister of Canada, made Alexander the Governor General of Canada. The position that of a viceroy. Alexander would represent the King in matters having to do with Canada. Later in his appointment, King George granted him more control of matters pertaining to Canada. Alexander was warmly accepted by the Canadian people. He would become the first non-aboriginal chief of the Kwakiutl tribe. In 1952, Alexander returned to England at the request of Winston Churchill who wanted him to serve as minister of defense. Shortly after his return King George VI passed away. He was placed in on the Queen's Coronation committee and was charged with carrying the Sovereign's Orb in the state procession. Alexander retired from politics in 1954. For the rest of his life he would spend a great deal of time in Canada visiting family and friends. He passed away on June 16th, 1969 from a perforated aorta. Alexander was a member of th Grand Lodge of England and served as Grand Steward and a Grand Warden.